The long and short of it? People like good content no matter the duration. One of the big debates in the content marketing world is: Long vs. Short. Do people prefer long-form content or do they prefer short-form content? 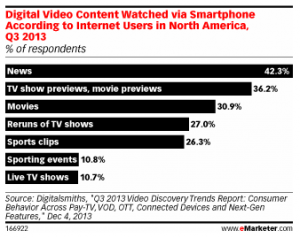 The debate has been increasing lately with the increase use of online video. The general consensus seems to be that people prefer short videos. The evidence is vast showing that people do watch all kinds of short videos on services like YouTube and even on sports websites like NFL.com and ESPN.com. People also watch all kinds of clips from TV shows. But now there is evidence that people like longer video content too. A new study shared on eMarketer shows that people like long-form video content just as much as short-form. In the blogging world the conversation about content word count and length has been an ongoing debate for sometime. There are good arguments for both types of content. Long content seems to do better with ranking in search engines. Short content seems to do pretty well for getting viral-type traffic from social media and it’s also good for generating frequent visits throughout the day from repeat visitors. So what does this mean for your content strategy going forward? People are diverse. We all have our preferences, but we’re open to slow change. We might not be quick to accept change, but if something piques our interest we’ll look into it. I think that’s how it works with content. When you’re new to content marketing you can try all sorts of things, but over time you’ll stumble on a formula that works. It might be a series of 500-word blog posts. It’s good to keep doing this, but over time it’s good to experiment with different lengths and types of content. You could try a few 200-word posts or 2,000-word posts. You could even try video. Action Step #1: That’s the first recommendation – try different lengths of content. Write a few long guide-type posts. Try adding quick 50 to 100-word posts throughout the day to keep people coming back to the site. Action Step #2: The other recommendation is to experiment with different types of content. You can start with a blog post and repurpose it into a video or slideshow. There are lots of ways to change types of content. Repurposing is one way, but you can create unique content for other formats as well. The point of this article is that your content can take on any form you want it to take on. Focus on success. You’ll know what works by the number of visitors you get to your site. You’ll know by the number of new customers you get as a result of your content marketing. At GBW, we’re always trying to improve our blogging for our own blog and for the blogs of our clients. This involves experimenting with both long and short blog posts. In 2014, we changed our rates for blog posts to go by word count. For some clients we mix the short-form blog posts with the long-form blog posts. It can be a very good strategy because it brings diversity to the blog. So moving forward with your content should involve the type of content that is successful for you. And there’s a good chance that involves different content lengths (short vs. long) and types (text vs. video).